Best Time of the Year to Visit – Year Round! Spring in the Hickory Nut Gorge is absolutely gorgeous with dogwood, daffodils, red bud, and forsythia blooming in April. 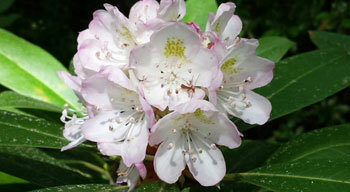 Then in May the mountains are covered with mountain laurel (pictured), crab apple, flame azaleas and wild cherry trees. June brings our purple and white rhododendron and wild orange day lilies. And our leaf color in the fall is spectacular! On Easter Sunday every year a sunrise service is held at Chimney Rock State Park. Admission is free to enter the Sunrise Service. Come celebrate Easter with song, scripture and spiritual music as a spectacular sunrise ascends over Lake Lure. Guests are invited to stay and enjoy the Park all day. Saturday, April 20 – The annual Gorge Sale on the Trail. Find exceptional bargains at this 19-mile yard sale stretching from Gerton through Bat Cave and Chimney Rock to Lake Lure and Rumbling Bald Resort along Hwy. 64/74A. 8 am - 2 pm. Memorial Day weekend kicks off our summer season with our Arts & Crafts Festival held Saturday, Sunday and Monday of Memorial Day weekend, rain or shine. Festival features fine arts and crafts, food booths and entertainment. Downtown Lake Lure, across from the Beach. 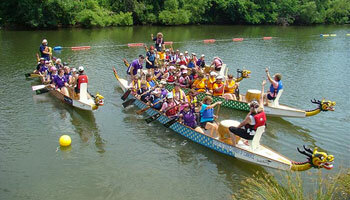 June 11 – 9th Annual Dragon Boat Races on Lake Lure. Lake Lure’s “Lure of the Dragons” race and festival combines fun festivities with team building and exciting competition! With drums pounding out stroke cadence, up to 34 corporate and community teams will paddle 250 meters down the Rocky Broad River in 30-foot long dragon boats dressed out in dragon heads, tails and scales! All competing for first place and all in the name of children's charities! Aug 11 – Annual Race to the Rock – Chimney Rock State Park. 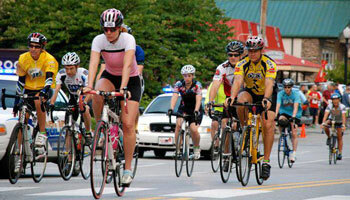 The grand finale of the 15th Annual Lake Lure Olympiad – a 3-day family sports festival that showcases the beautiful scenery of Lake Lure and Chimney Rock, the Race to the Rock is a challenging 5k run or 25-mile bike race that climbs 900 feet in the last 3 miles (a 7-9% grade) to finish at the base of Chimney Rock. The rewarding 75-mile views from the finish line overlooking Lake Lure are enough to take your breath away… or what’s left of it! This is the ONLY TIME you can ever run or bike up to Chimney Rock. Advance registration required. Fees vary. Live Music at the Gathering Place in Chimney Rock Village. Lake Lure Cloggers and Vintage Vinyl. Dates to be determined. 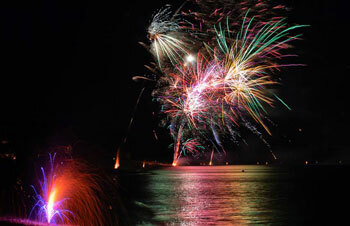 Fireworks Display: Saturday, July 3. Lake Lure Beach. 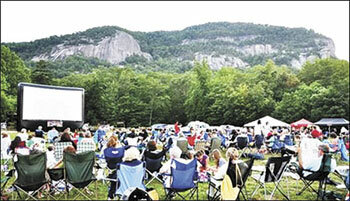 May 21 - 7th Annual Spring Go Festival at the Gathering Place in Chimney Rock Village. Family fun throughout the Village. Pancake Breakfast, Parade, Sidewalk Sale, Cowpie Bingo Raffle, Symphony of Rutherford County at the Gathering Place and more. 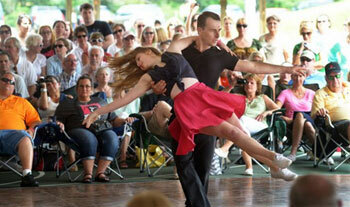 Sept 13 & 14 – Dirty Dancing Festival – Lake Lure. For the last several years the Dirty Dancing Festival has rocked Lake Lure with a lakeside screening, family dance festival, and the official festival After-Party Dance Party! August 9-11 – 15th Annual Olympiad. This 3-day sport and community festival features dozens of events and activities for people of all ages and athletic abilities. Beach BBQ, free water ski show and Race to the Rock (ride or run to the "Rock" on Aug 12 at 7:45 a.m.
October 19-20– Lake Lure Arts & Crafts Festival. Local artisans display their work for sale. Enjoy food, fun and music too. October 31 – Trick or Treat in Chimney Rock Village. Last day to vote for your favorite scarecrow. December 7 and 14 - Christmas in Chimney Rock Village. Stroll our quaint mountain village streets all lit up with white lights and get a head start on your Christmas shopping in our craft and gift shops. December 7 and 14 – Santa on the Chimney. 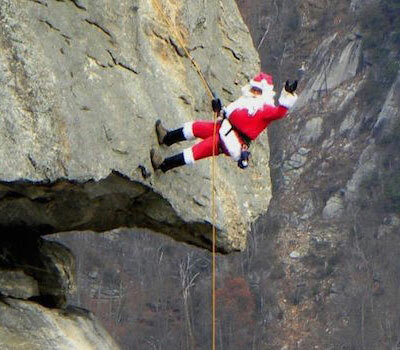 (11 am - 2 pm) Santa practices scaling chimneys in Chimney Rock State Park. USA Today named Chimney Rock one of the "10 great places to catch up with Santa." January 1, 2020 – Polar Plunge. 12 Noon. 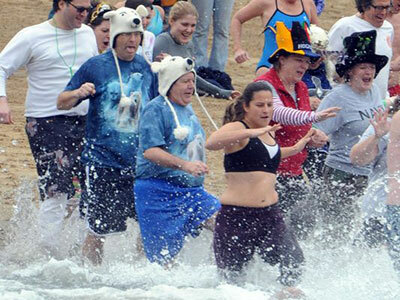 (registration 10:30 - 11:30 am) Take the annual New Year's Polar Plunge at the Beach at Lake Lure and freeze for a reason – to support local charities. If you're not feeling that brave, come see the fun – there will be bonfires to keep you warm!